Placing the blame regarding power cuts squarely on the Government, Sri Lanka Podujana Peramuna (SLPP) yesterday said load shedding was a direct result on the current administration’s failure to implement new power projects over the last four years. SLPP Chairman Prof G.L Peiris said that top officials of the Government had delayed power projects intentionally, as this created a situation where there would be no option but to go for emergency power purchases at higher prices. He charged that this allowed interested parties to earn high commissions at the cost of the public. A copy of the letter sent to the Power Ministry Secretary by the Ceylon Electricity Board (CEB) to inform the decision to commence load shedding was leaked to the media on Sunday. 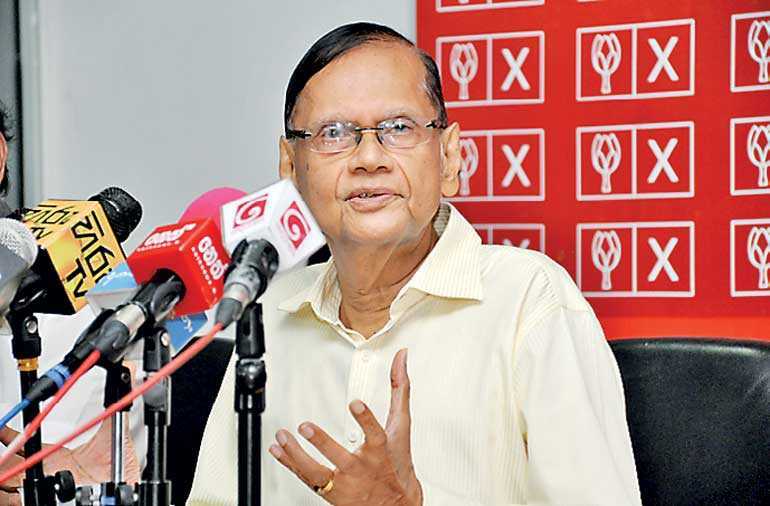 “This is a serious matter, we feel some people are trying to earn profits through emergency power purchases, which will eventually increase loses for the CEB,” SLPP Chairman Prof G.L Peiris told reporters at the party head office in Battaramulla. He charged that the power shortage arose due to the inability of the Government to implement new power plants to meet the demand. Prof. Peiris claimed the current Government failed to implement new power plants since it came to power, which was the reason for load shedding. However, CEB has not been able to commission any new power plants included in their Long Term Generation plants since 2013. “All they care about is the commission they get. They do not have genuine intention to solve power shortages, if so they would have already started new projects by now to solve this issue,” he added. Prof. Peiris charged that the Government was solely relying on hydropower generation, which could not meet the demand due to the prevailing dry weather. He also went on to say if this situation continued, CEB might have to extend the time for load shedding. Despite the CEB decision to carry out load shedding, the Public Utilities Commission of Sri Lanka (PUCSL) had written to the CEB, questioning its decision to carry out scheduled power cuts, noting that scheduled power cuts without prior notice are illegal.